There have been great rock novels written about famous fictional bands (How the Mistakes Were Made) and wedding bands (The Wishbones); told from distinctly American points of view (Vexation Lullaby, Losing in Gainesville, anything by Carson Mell) and with more of an international scope (Banned for Life, The Commitments, Wonderland); from the perspective of a rock star (Great Jones Street), an obsessed fan (High Fidelity), a music critic (Never Mind the Pollacks), and the sister of a rock also-ran (Stone Arabia). 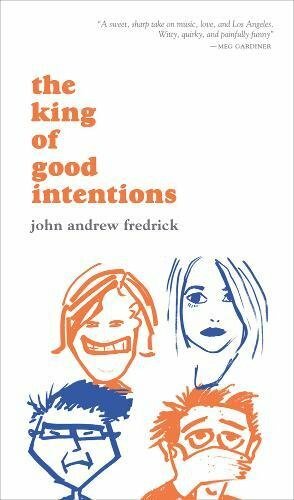 Missing from the canon was a novel from the point of view of a musician who sports a serious flare for eloquent language, but John Andrew Fredrick has offered just that with The King of Good Intentions. It’s the author’s debut novel and the first of a series of his rock novels exploring the travails of the Weird Sisters, a nascent L.A. band that suffers familiar Nirvana-era conflicts associated with success. The living room (where Jaz crashed): magazines everywhere, newspapers, bleeding pens, cans, milk cartons, ripe socks, exhausted shirts and towels, a telephone and answering machine, books, more newspapers (Jaz was a newspaper fiend), shoes, swim fins (well, one), dishes, plates, marijuana paraphernalia, wiffle balls and wiffle bats, and lots of other stuff on the floor. I could leaf through the Times … or lean back and dream at the October sky— marshmallow clouds and Prussian blue air and discernible ugly smog hovering in the distance, hot wind-play in the penchant poplars, sycamores, oaks, palms and eucalyptuses, the sparkle of falling leaves like talking hands in burnt tangerine and warm gold and quite deep brown. John’s ability to dole out eloquent turns of phrase suggests he’s not going to be stimulated by three chords forever, but the right motivation is paramount. When the rainy spell stopped and the air was fresh for a day or two after, we went on bike rides up to Griffith Park and looked at the picnickers and the tall hills and shrubs and eerie-pretty trees so spindly and rain-wet and water green that they look almost black. And sat under them, with anoraks under us, gazing at the indefatigable California post-rain sky so impossibly blue and the sun a fuzzy gem and so low in the sky you felt like you could command it down to the palm of your hand and hold it like a coin. John seems on a path out of the flop house existence until the fetching, inaccessible Sarah gets a flat tire, and he’s unable to resist the pull of a women who by all accounts doesn’t care a wink for him. Ah, young rock love. If Fredrick’s tale ever falters, it’s when John slips into a know-it-all un-likability. The character pretty much hates any band not safely canonized as cool, and he’s happy to tell you about it. At the novel’s best moments, John’s snobbery is offset by his very relatable tendency to blab when he shouldn’t, getting himself into honest trouble and bringing the comedy of his character to the fore. Long thought to be beyond the purview of literature, the rock novel has always been about trying things out and seeing what works. Such experimentation has led to some of the most memorable additions to the genre, and a few Frankensteins. Fredrick’s attempt to expand the rock novel’s possibilities with a protagonist enamored with both word and melody is a welcome addition to the fold, satisfying without overstaying its welcome. Art Edwards’s reviews have or will appear in Salon, Colorado Review, Los Angeles Review of Books, Electric Literature, Barrelhouse, The Collagist, Entropy, JMWW, and The Rumpus.